A collaboration of scientists (from Denmark, Brazil, Germany and the UK) developing a new detection and treatment method for breast cancer have recently published early results from their work in the Journal of Alloys and Compounds. One in eight women will develop breast cancer, making it the most common cancer in the UK. Current detection methods (such as mammograms) can only detect between 65% and 95% of cancers, and developing better methods of detection is a priority. 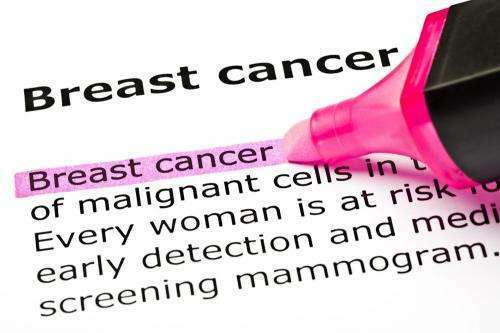 If not detected and treated early enough, breast cancer can spread to other areas of the body, increasingly the likelihood that the disease will prove fatal. The team of scientists have been using the POLARIS instrument at ISIS to develop a new bio-nanocomposite that they hope will ultimately lead to earlier detection, and more successful treatment, of breast cancer. The new material takes advantage of the fact that cancer cells attract a molecule called hydroxyapatite, which is a component of bones. The team are developing magnetic nanoparticles coated with a biocompatible polymer that includes hydroxyapatite nanocrystals. When introduced into the body, these nanoparticles should make their way to cancer cells – and once they do they make it much easier to detect the tumour on an MRI scan. Not only do the nanoparticles help to detect cancers, but they may also help to stop them spreading to other parts of the body, as hydroxyapatite is known to inhibit that aspect of tumour activity. The next step for the team is to incorporate anti-tumour drugs into the nanoparticles. The magnetic nature of the nanoparticles means that they can be directed to the site of the tumour by using magnets outside of the body. If anti-tumour drugs can be added to the nanoparticles, then they can be used to deliver the treatment directly to the tumour, improving the efficiency of the treatment and reducing the risk of harmful side-effects - imagine a fleet of tiny drones, delivering anti-cancer weapons right where they're needed. This research is at a very early stage, and far more work is needed before it can be developed into a treatment option. You can read more about the science involved in this project on the ISIS website.